The wooden square bowls I thrifted in Florida. The two ceramic bowls I picked up last year at Goodwill. The two small woven bowls I found this year, also at Goodwill. Several of the wooden plus black and white bangles I've also found through thrifting and consignment shops. I wear these bangles more now stacked and wear the cuffs a little less. 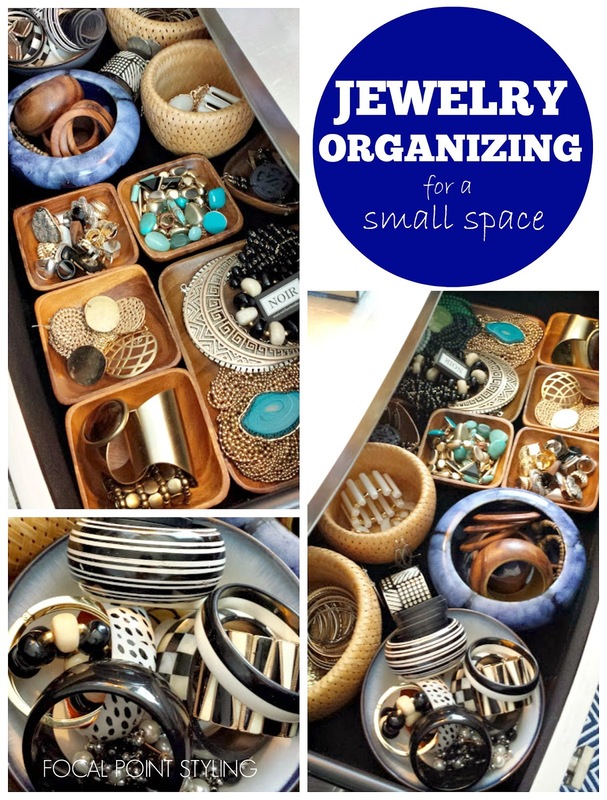 For the square bowls, one has all rings, one is gold earrings, one is for three gold cuffs, and one is for the turquoise I'll wear most. 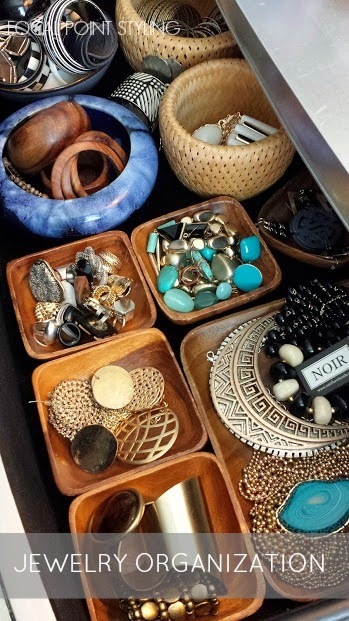 The wood platter is holding some of my summer necklaces, but the majority of my wooden beads are downstairs on a dress form next to the amoire - which I actually pass on my way out (through the laundry room to get to the garage) so I can still easily grab one on the way out. 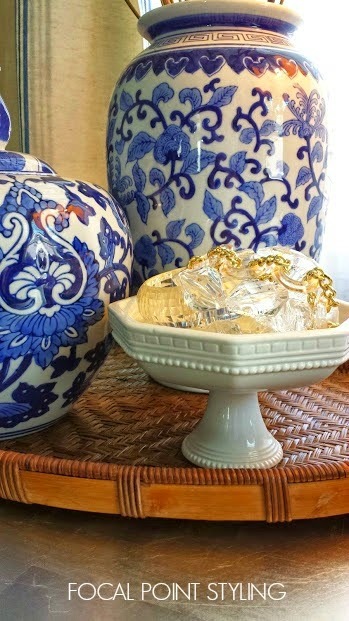 I love this petite white bowl - it's just the right size to hold another category of jewelry: Lucite & Gold. It was only $2 at TurnStyle Consignment. 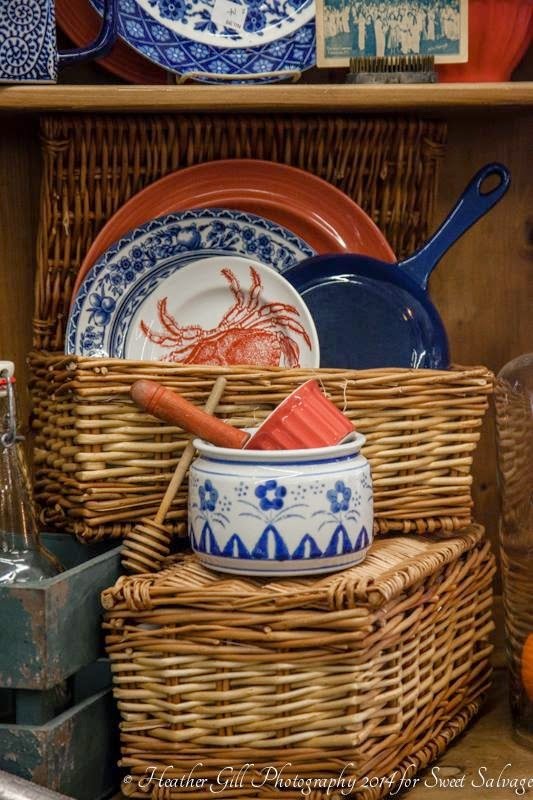 I like the way it works to complete the trio composition on the rattan platter I'm using as a tray. 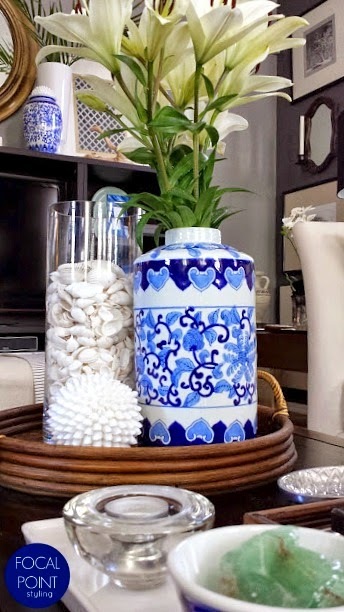 To layer pattern in the bedroom I've picked up a few new blue & white finds at HomeGoods - a vase for flowers and the jar, with its top is great to stash hair ties. Above was how it started out - which is what happens over time living in a new space - You start to learn what does and doesn't work for your lifestyle. 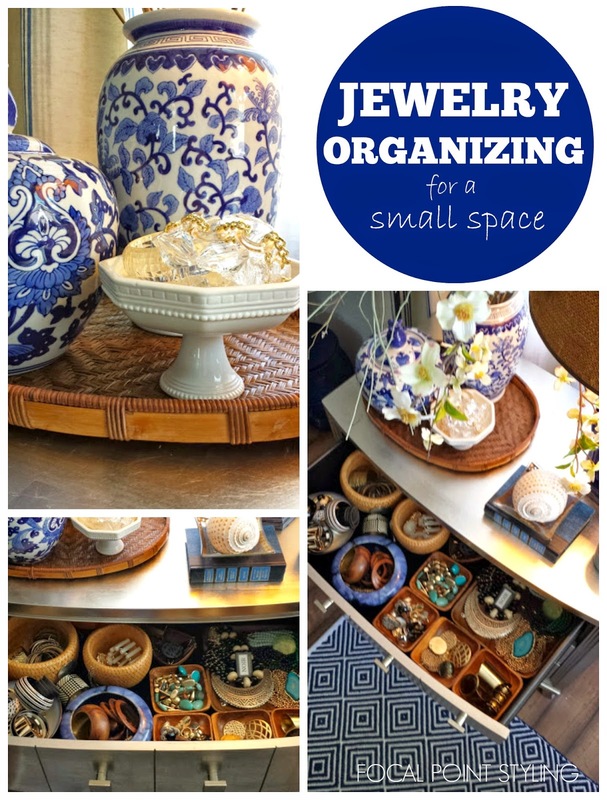 Sometimes the concept may be right, but needs a tweak - which a simple shift and shopping thrift can help resolve and help improve home organization functionality, which is very important in a small space. 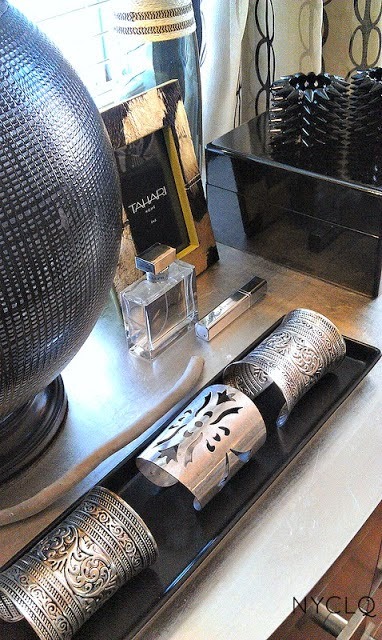 The black lacquer box + frame + candle tray (holding cuffs) are from HomeGoods. 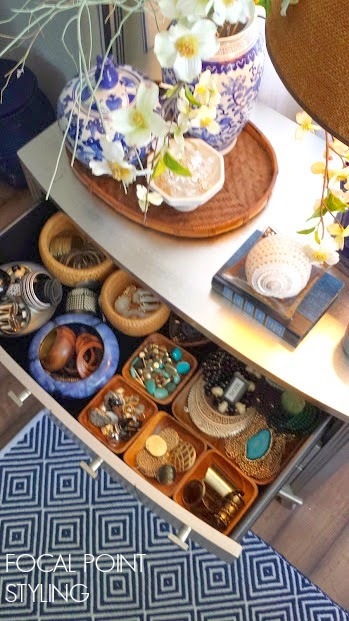 While the second and third drawers remained relatively the same, the top drawer is what got a serious downsizing, and now fits into the bedside table - so it's all still conveniently located adjacent to each other when getting dressed. 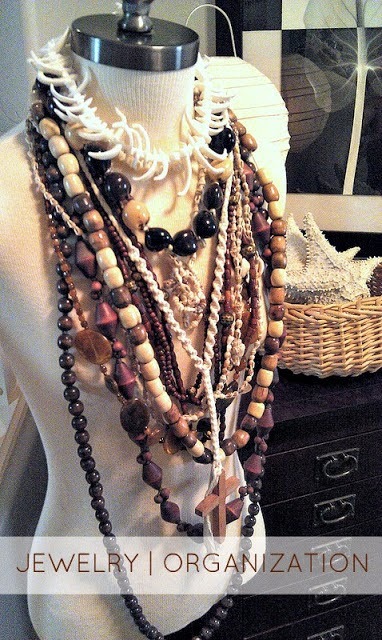 A dress form is great for layering wood beads - although it's probably three less today. 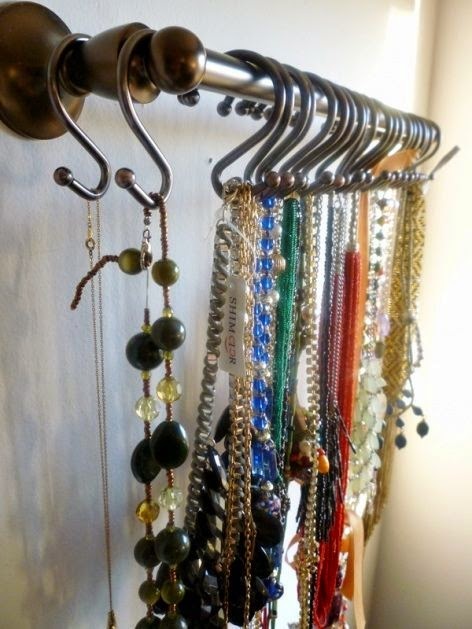 If you prefer you necklaces hanging, maybe inside your closet if you have the space, I think this idea of repurposing shower-hooks and a towel bar is clever. 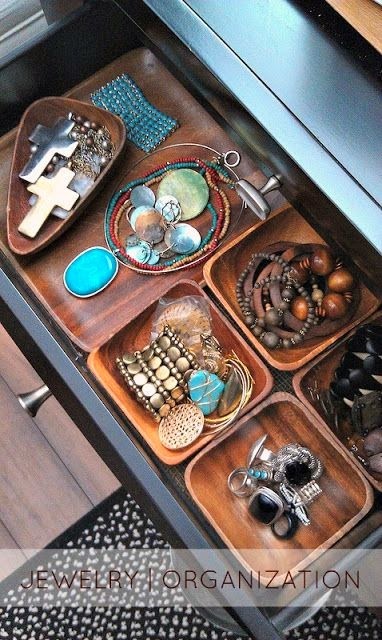 Ideally though, having a chest of drawer trays, inside your closet is the best solution of jewelry organization. 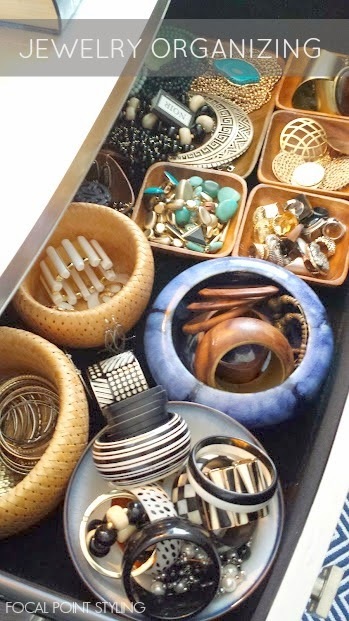 The covered storage will help protect your pieces from dust, or worse yet, getting caught on something and breaking. 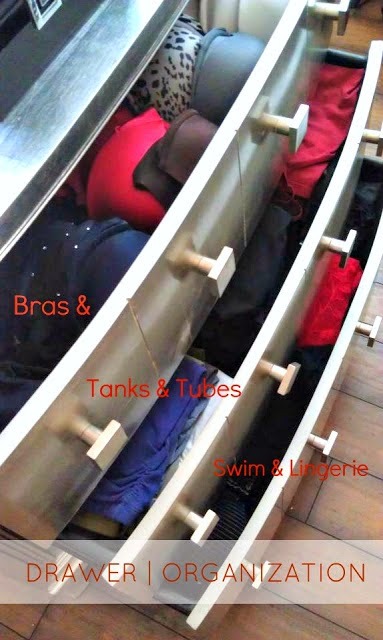 Drawers also make it easier to colorize... which if you have a small space, and you need to use what you have, small bowls are an optional solution. 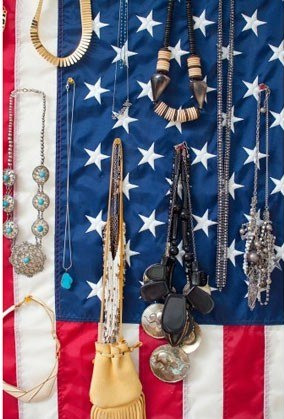 If you're not going away for a Summer vacay during the July 4th long weekend, closet organizing may be a task to tackle. 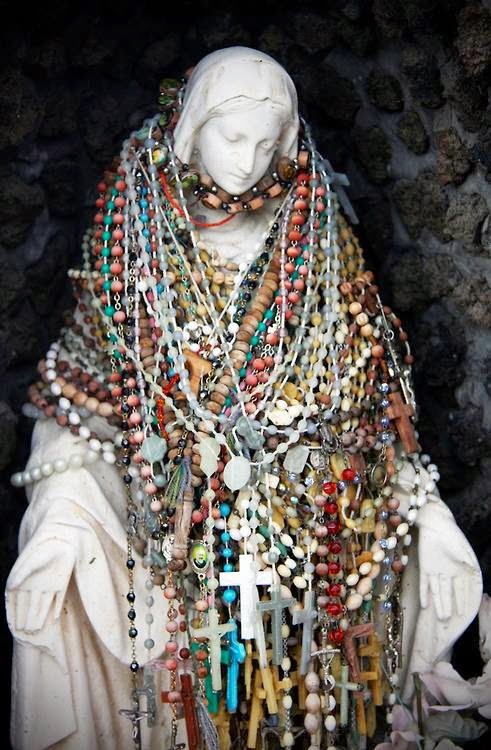 Usually, the specialty and department stores will have their end of the season clearance deals (to stock up on more jewelry!! ), as they start to get their sales floor cleared for Back To School goods... and... Fall. 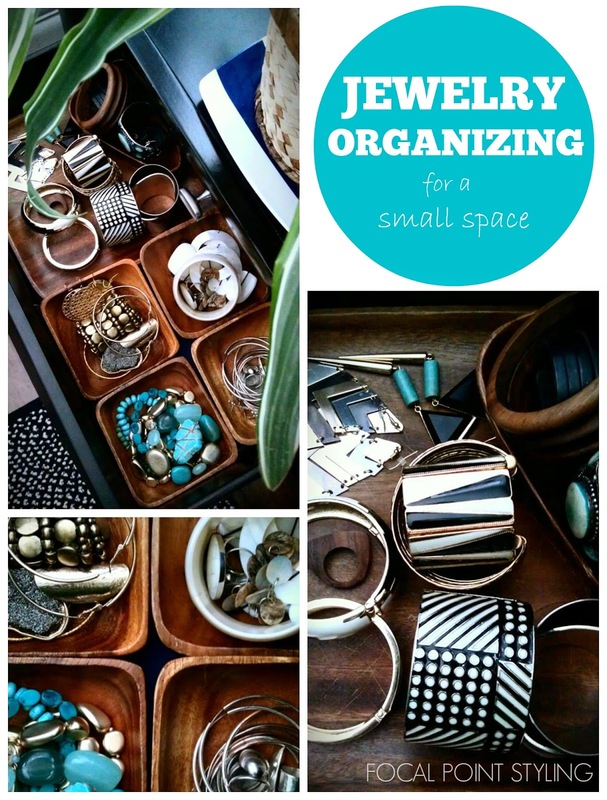 What are some ways you organize your jewelry? Keeping a home fresh and updated can help give your family's lifestyle a positive source of energy and a safe haven to relax & rejuvenate in. 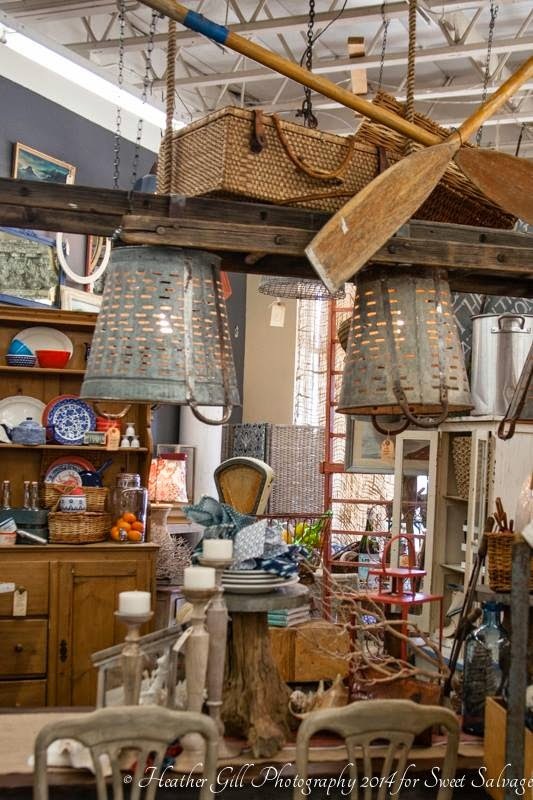 However, at times it can be challenging to do this living in a rental house - especially if you enjoy change and doing projects to help keep the home up-to-date. 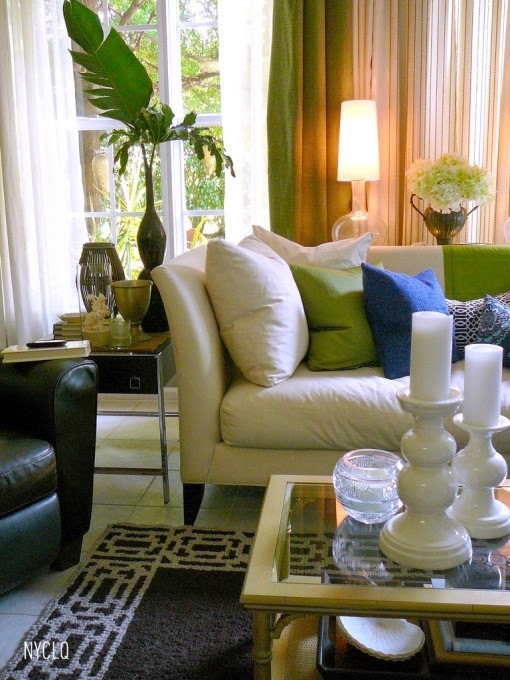 For example, you may want to paint a room a new color, but in a rental, most times painting is not allowed. We've lived in our rental house now for two and a half years, and thankfully, having been allowed to paint the rooms in neutral shades of grey when we moved in, I've been able to create seasonal restyles with textiles and accessories I already had - but even that can get a little tiresome. 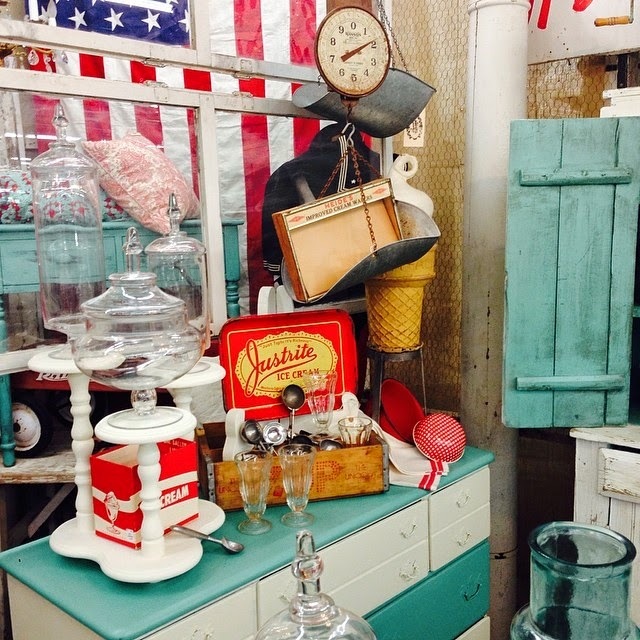 Doing a little home decor purge can help. 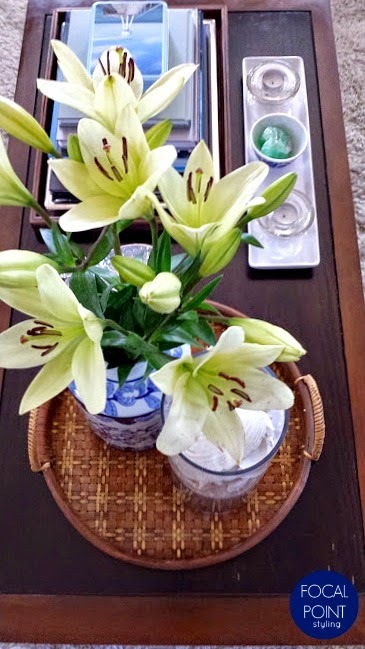 Back in March, I did a pretty major Spring Cleaning purge, taking most of my home decor (& wardrobe) purge items to consign plus donation, which gave funds to pick up some new items to refresh our style in this house, without the hassle of having a garage sale. 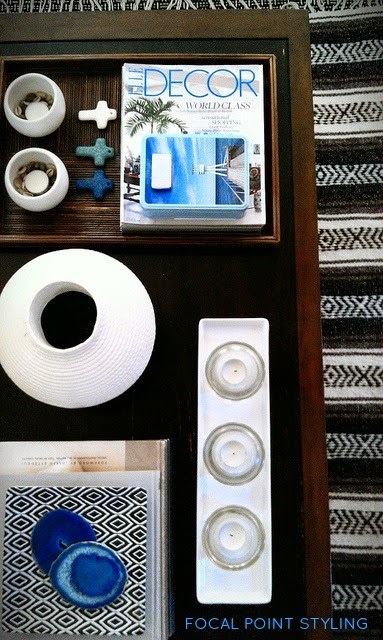 B&W with a hint of mint, blossoms and coffee table change. 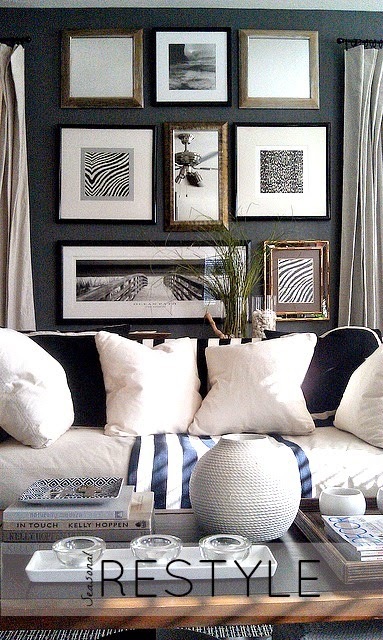 Bold & graphic B&W, with directors chairs and faux gold bamboo FL thrifted coffee table. I did this purge because our lifestyle has changed - not just because of moving from Florida to Arizona, but even the space we live in and how we use it has changed. For example, I'm not sitting "in the home office" anymore to blog or do social networking - I've spent the last year at the dining table, situated between the kitchen and the living room. Since we're renting and I can't paint but I wanted to look at refreshing watery blues, so this summer I layered in a strong dose of blue with the porcelain pieces plus even a few new blue frames. 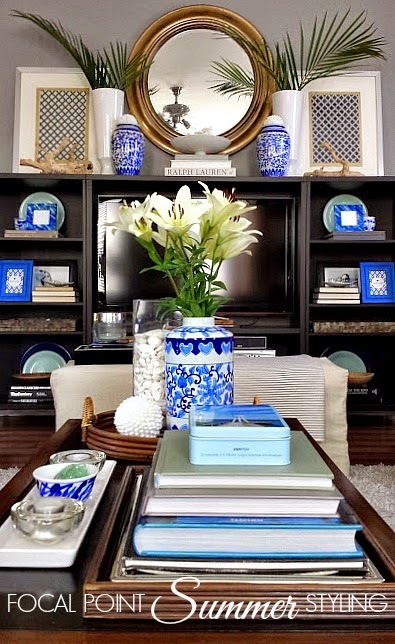 I clustered the blue frames on opposite sides of the room, on the tv unit and the buffet, which helped bring a sense of balance to the space. The frames will hold beach photos we took on a recent mini vacay to Newport and Carlsbad, but rather than print them in B&W as I usually do, I want to use the natural colors of the blue skies and ocean to again layer in color into the rental - without paint. 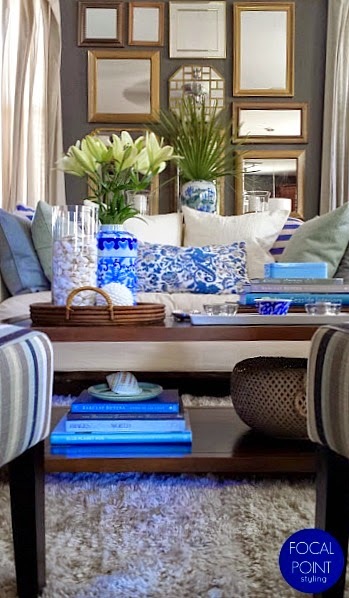 The new layers work with some already existing decor, such as the blue and the white linen pillow covers, blue bound book stacks, and furniture arrangement. The exception to the furniture arrangement was switching the directors chairs to armless slipper chairs (more comfortable & functional) plus bringing back the more sturdy coffee table. 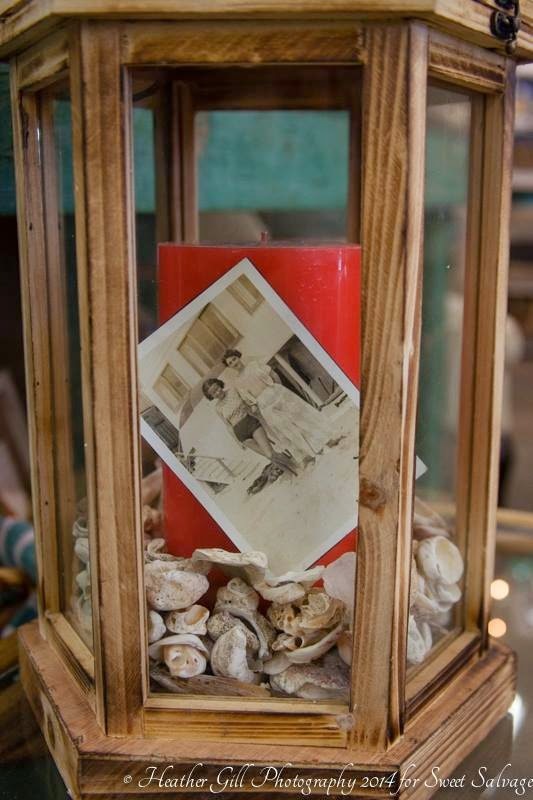 White shells in glass cylinder I collected all from Sanibel Island, FL. I keep a small paper inside the shells so I know where each batch came from. The round mirror I painted gold at holiday, I actually had painted blue last year! 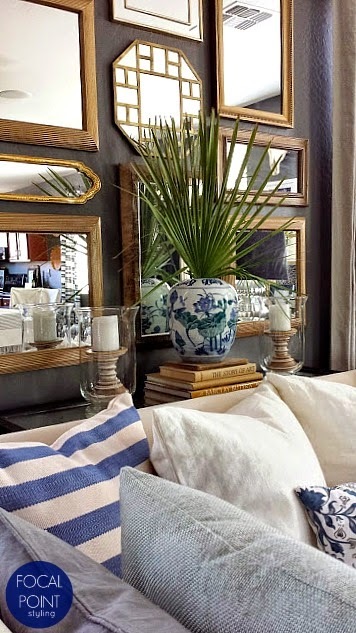 These framed fabrics (I did back in Florida - you can read at: Make a Framed Fabric Focal Point) I'll switch to a blue and white print. 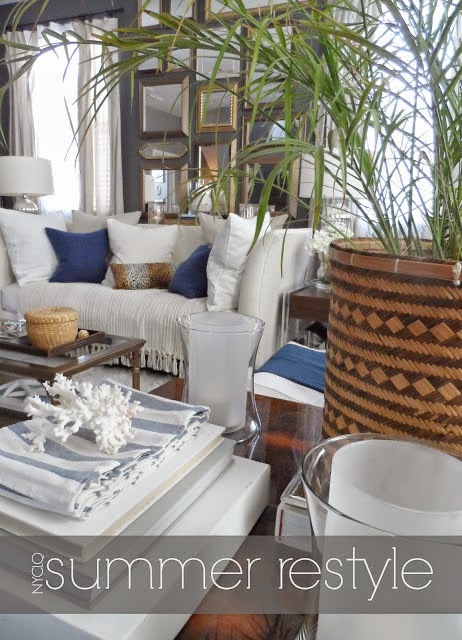 The grapewood branches I got at HomeGoods back in Florida (I think in 2010). The white pedestal bowl is alabaster (heavy!!) 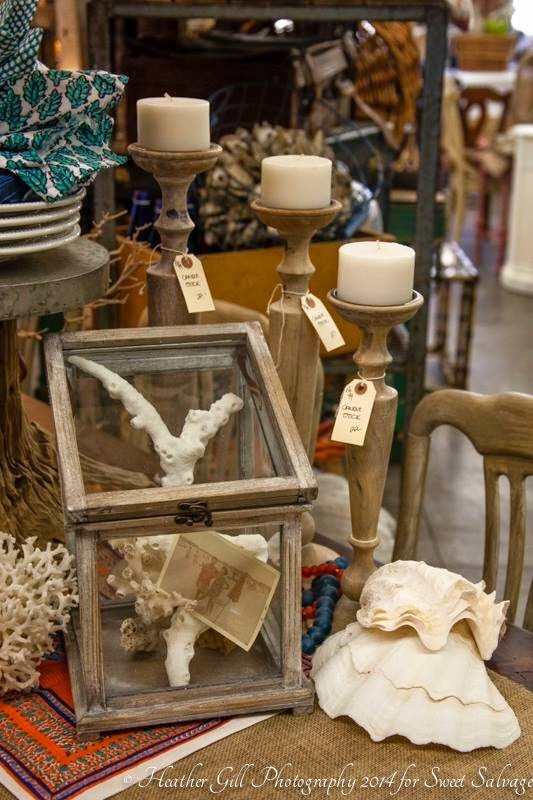 I scored at Goodwill here in AZ - and it's filled with Coral I collected in Key Largo. The blue box are seaside photo notecards I got in San Diego last year. 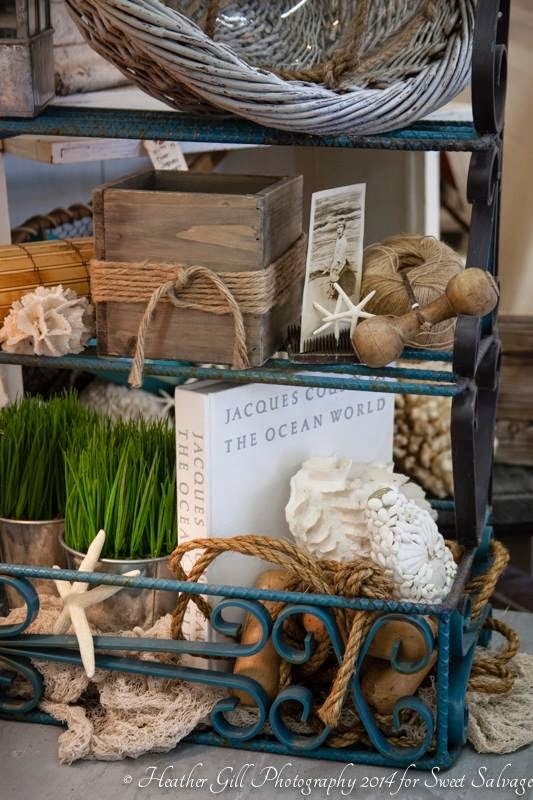 The Barclay Butera book was signed by Barclay at this years Winter LVMKT and the New Seaside Interiors book I just picked up in Barclay's showroom in Newport. 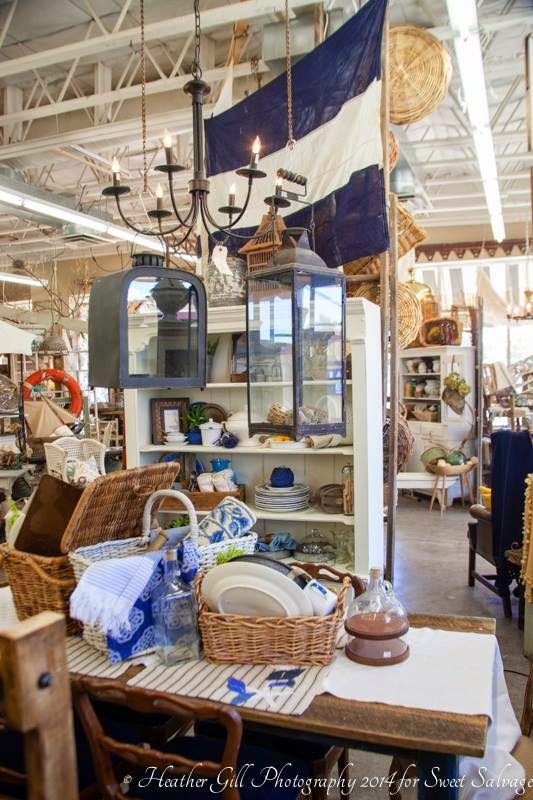 Storage Style, Ansel Adams, the rattan tray and blue bowl are all from thrift. 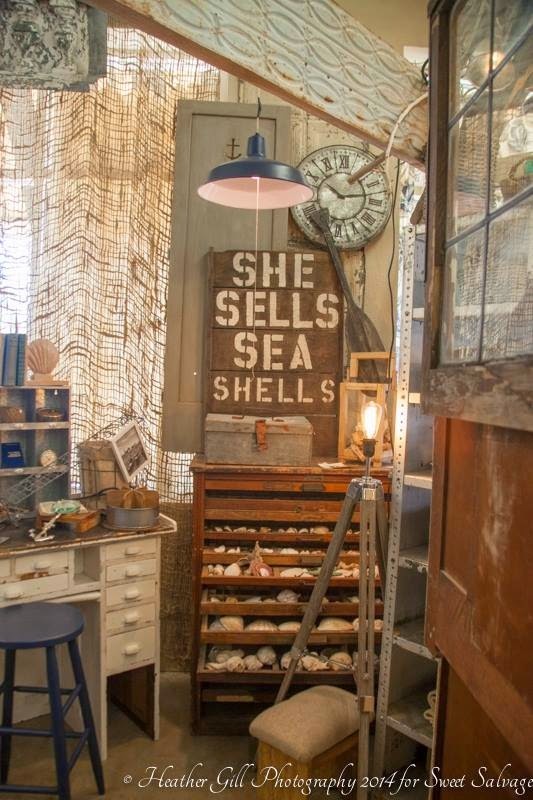 The shells are from the Gulf Coast of FL and Calsbad, CA. The globes: one is from thrift and one is from HomeGoods (2 years ago). The black stone is also from Quartzite, AZ. 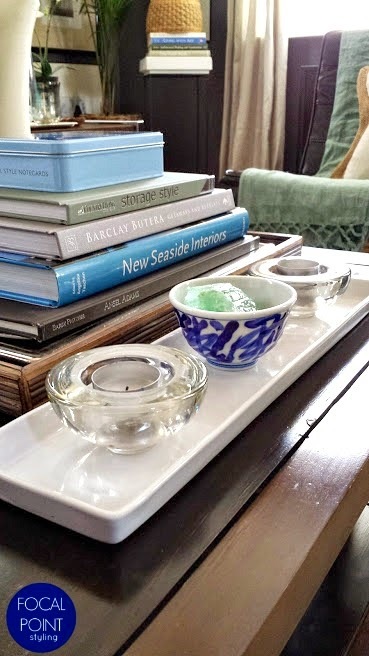 The aqua plates and B&W dish is from thrift and that silver tray was actually a clearance deal Jeff bought at his store (marked-down to $4). 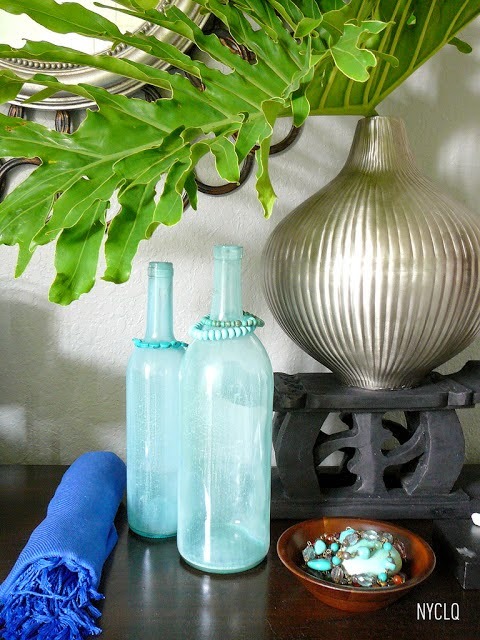 The glass hurricanes were only $4 (for both) along with the blue, white, green porcelain vase (I think it was $8) were all from a 50% off Saturday Sale at Goodwill. The mirrors and books were mostly thrifted - minus this Barclay book (Amazon used books and it's new!). 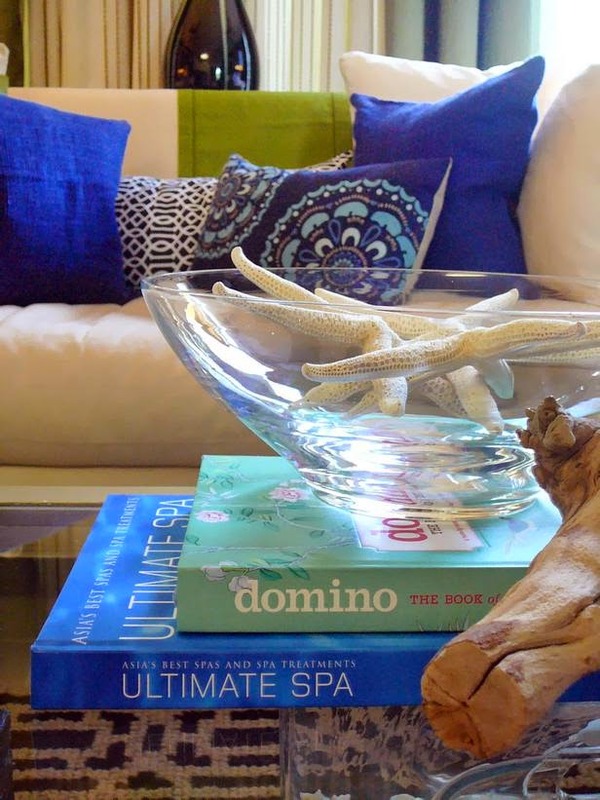 The books act as a riser behind the sofa - the vase would be too low without them. 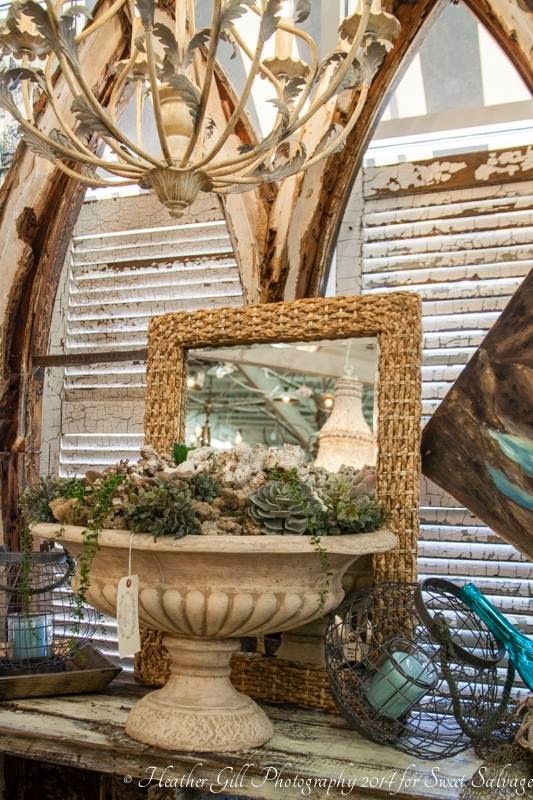 The white-washed wood pillars are from HomeGoods, Florida. The rope covered cylinder is from Frontgate. 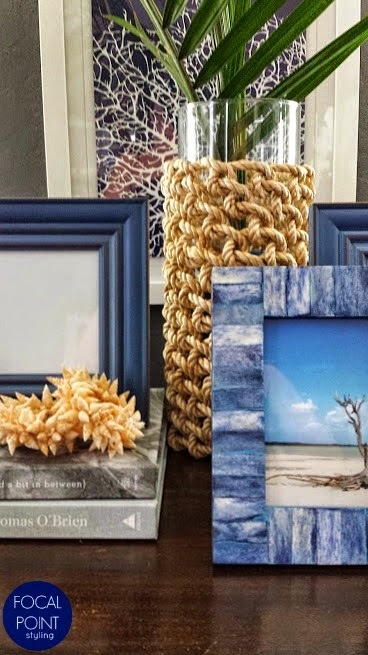 The blue & white sea fan wall art and blue frames are from HomeGoods. 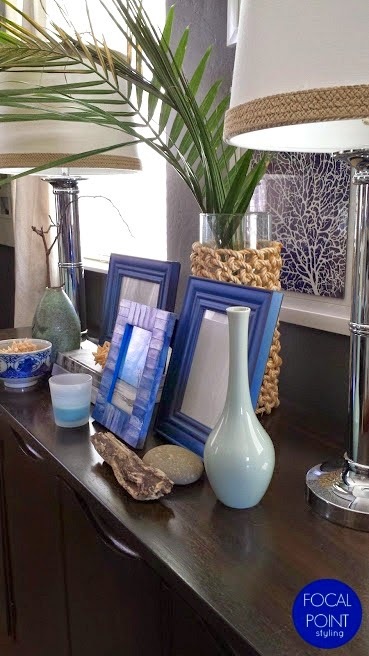 The tiny shell clusters are napkin rings I found while thrifting, and since I have my table linens (placemats + runners + napkins) in this buffet, it works as a decor detail for a coastal vignette. The picture is one of the notecards from the coffee table. Just need the right photo for this frame! 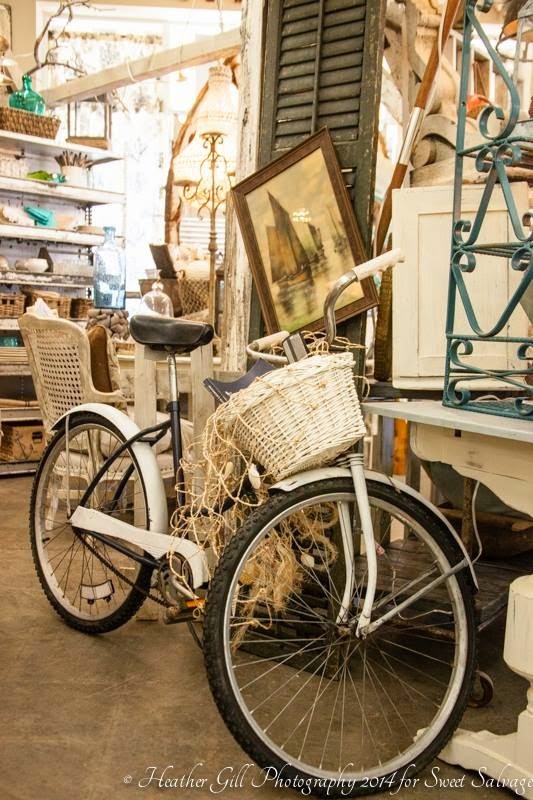 Consigning saved the hassle of holding a garage sale plus the funds have gone to get some of the newer items. 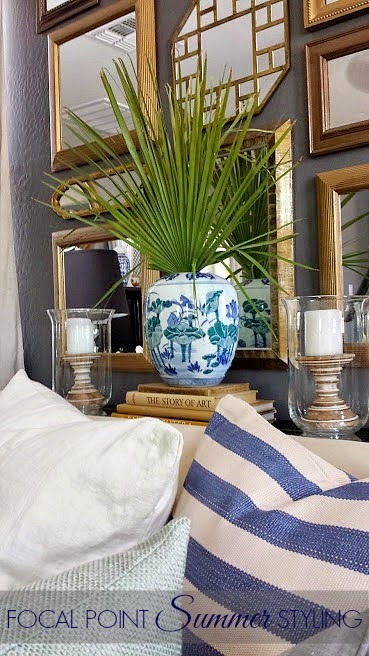 Along with using gift cards I've won from design challenges + sweepstakes winnings and a few thrift finds, I was able to refresh our rented house here in AZ with the coastal comfort of home - without it getting "too themed". It's not necessarily a 100% done - I'd still like to tweak a few details - but a welcome change nonetheless, especially with all the brown often seen here in AZ. 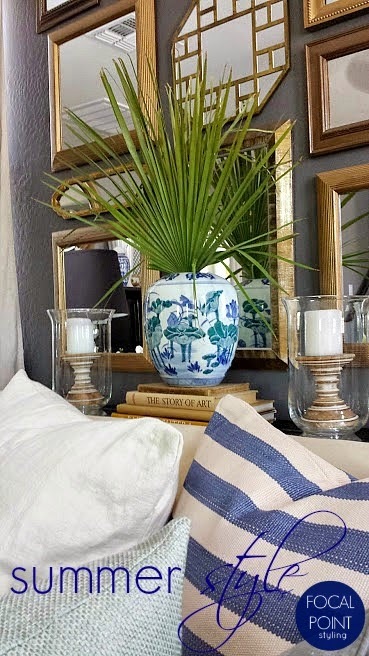 The change in the living room is coming from the addition of layering more blues paired with a pale grey-green, known as hemlock green, I had started mix in with my black & white this Spring (shown in the beginning of the post). 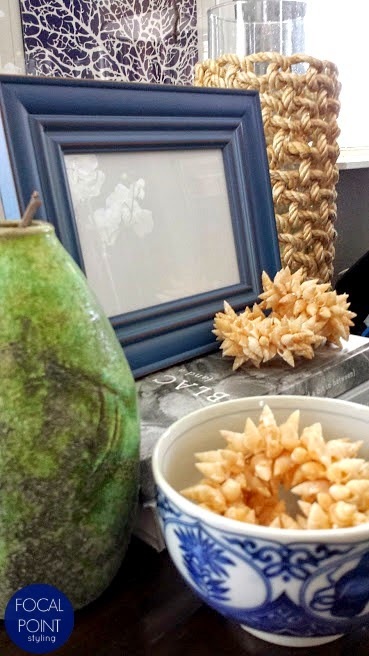 I first started to collect the porcelain for the Spring refresh I did for our bedroom and bathroom (posting next!) but that wonderful piece I found while thrifting one Saturday enabled the pattern to also work in the living room, which now creates harmony in the home, because the blues are used in five rooms from the upstairs loft area, to the bedroom, bathroom, garden room (downstairs) and now the living room... (I should probably post a home tour). 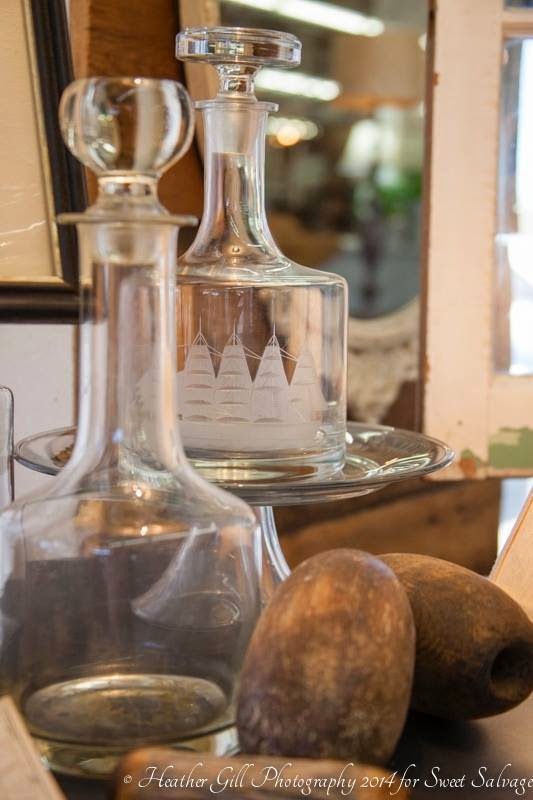 - Travel treasures such as shells from FL & CA and stones plus cow skull from AZ help tell our story. Not shown in the living room, but still up year round in the stairway, also telling our home story: Photos from Italy and New York. - Pair of Stripe Slipper chairs - Shipped slightly damaged when ordered for an AZ client makeover in 2013: Wayfair.com had me KEEP them and they sent a new pair for client. I did some repair - now we them use everyday. 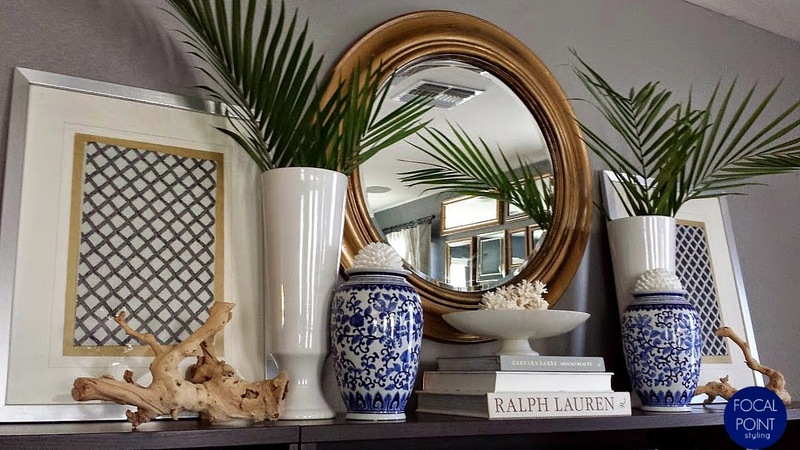 - 2 Large White Urns (above TV with palms) - Clearance at Target: $10 each - orig. $35 ea. - Print and frame personal photos into new blue frames. 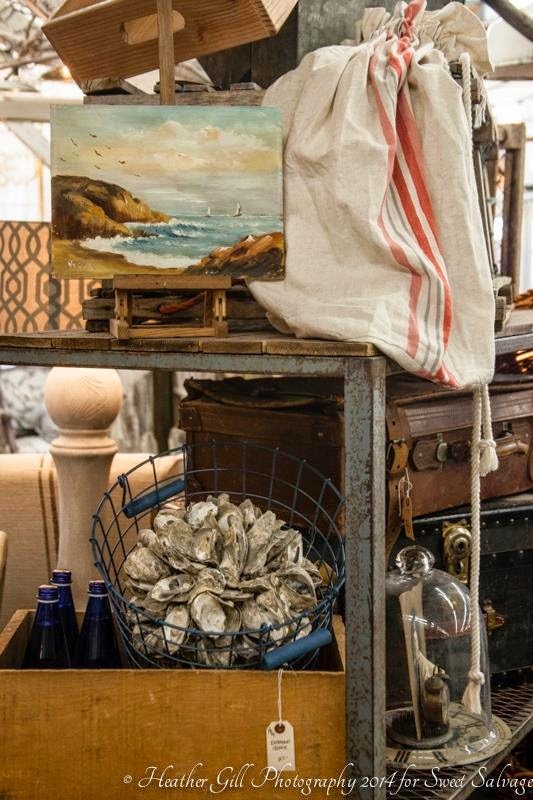 - Change large frames to framed blue fabric prints and coastal images. I believe it's only natural to not necessarily stay with a style today that you loved ten or even five years ago. 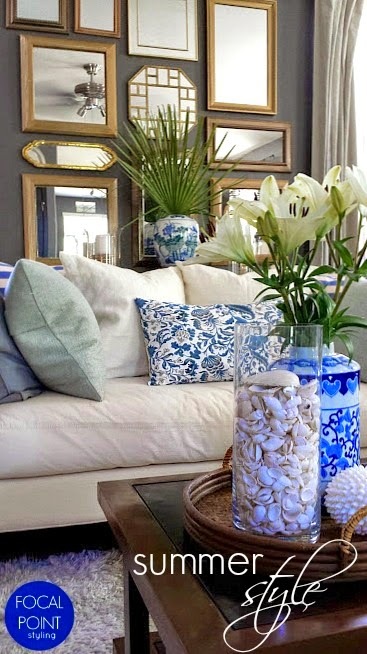 Even if you still admire a style, for example I love coastal, but the way I put it together has changed. In Florida, I was heavily influenced by more vibrant Caribbean colors and tropical flavors, whereas here in AZ the colors pale in comparison - to the point where our first summer here I only used black and white - no color. 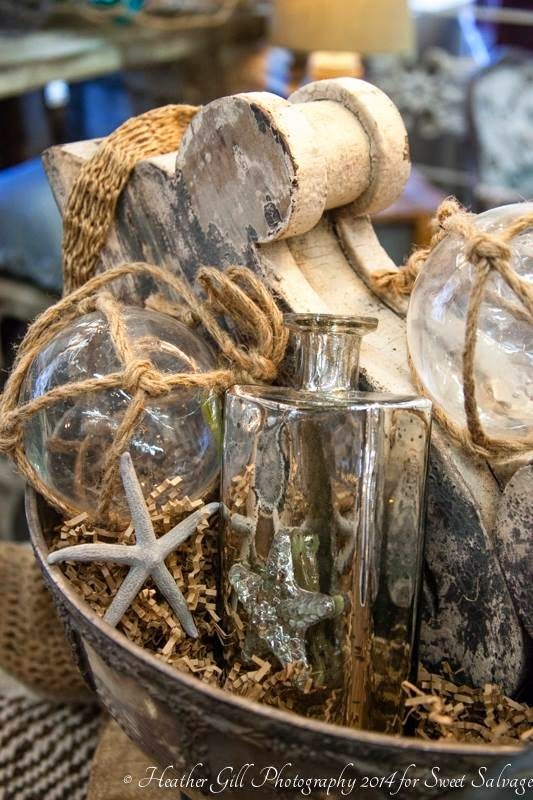 Also in the past, I would only put out my coastal treasures from our beach trips during the summer, and then pack them up until the following summer. 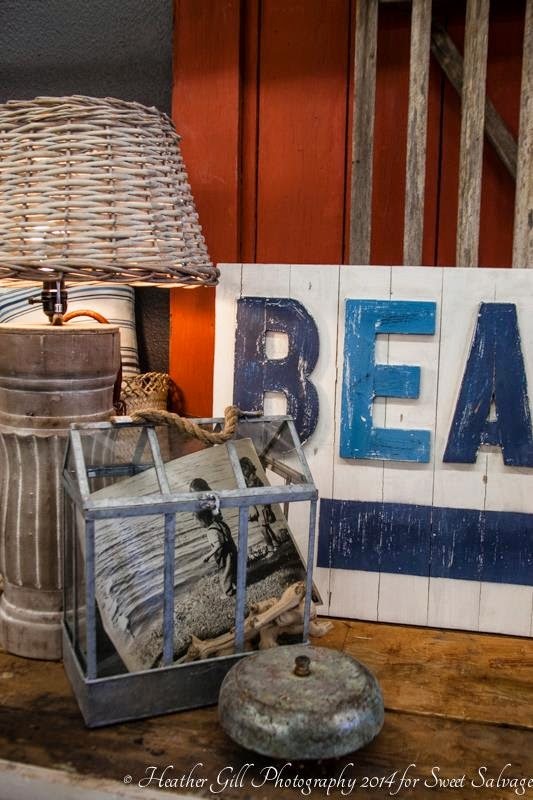 Living here in AZ, the coastal keepsakes (from Florida and now also California) have become a part of our home story and a way to stay connected to home back east, since I've evolved to keeping most (but not all) of them out year round. 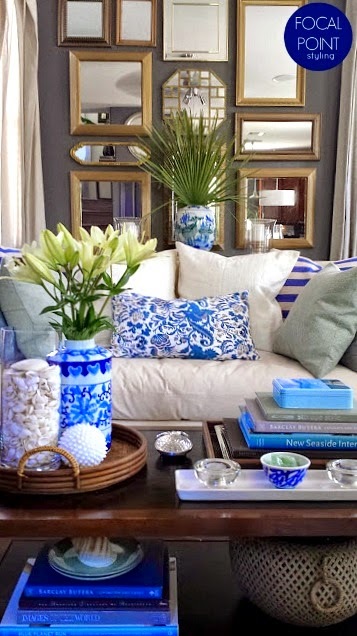 Simple summer style touches can be layered into almost any style home. 1. 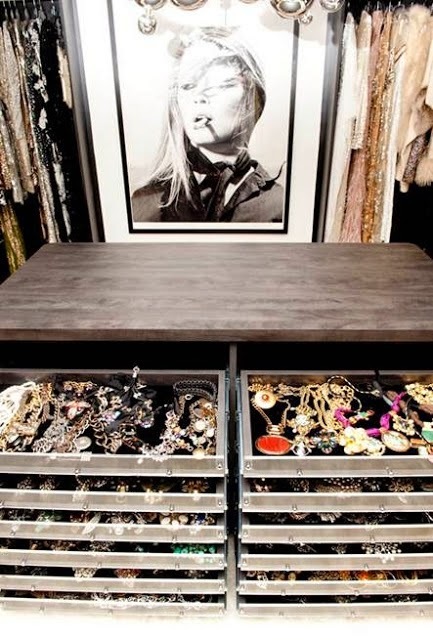 Edit out the use of black by replacing with more whites for an airy feel. 2. 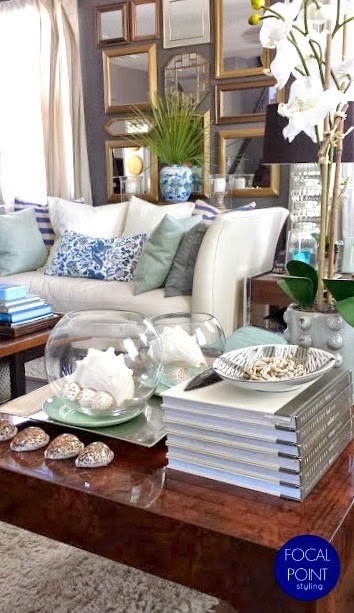 Use touches of a water based scheme, whether it's lakeside or coastal. 3. 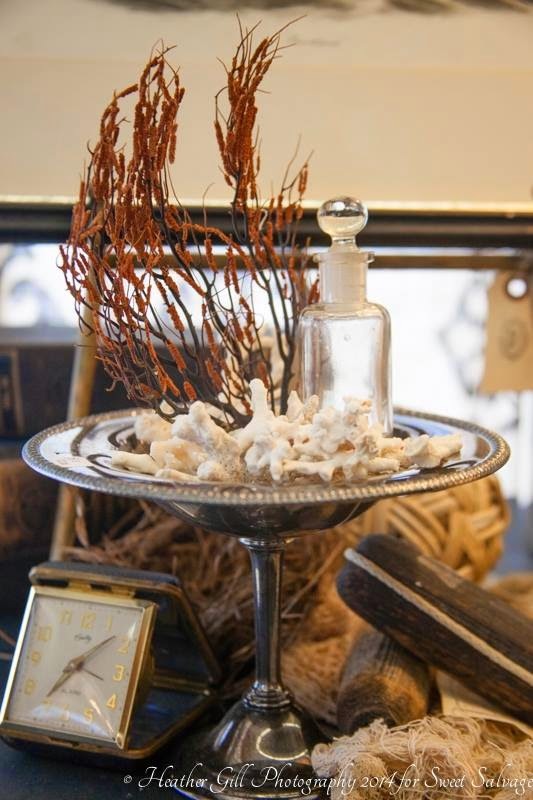 Using trays, bowls and cylinders are great to display a collection of shells, starfish or coral - especially on a coffee table, sofa table or buffet. 4. 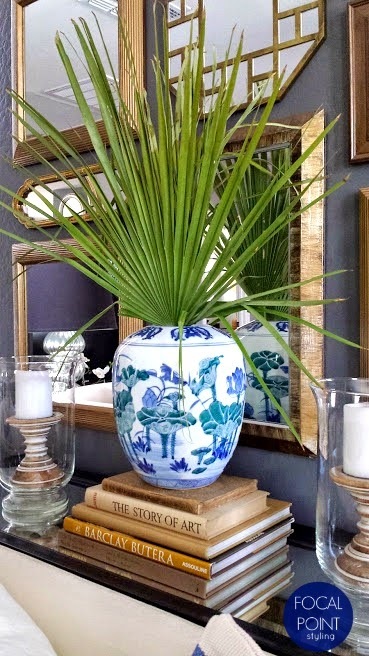 For a tropical touch, add palms. 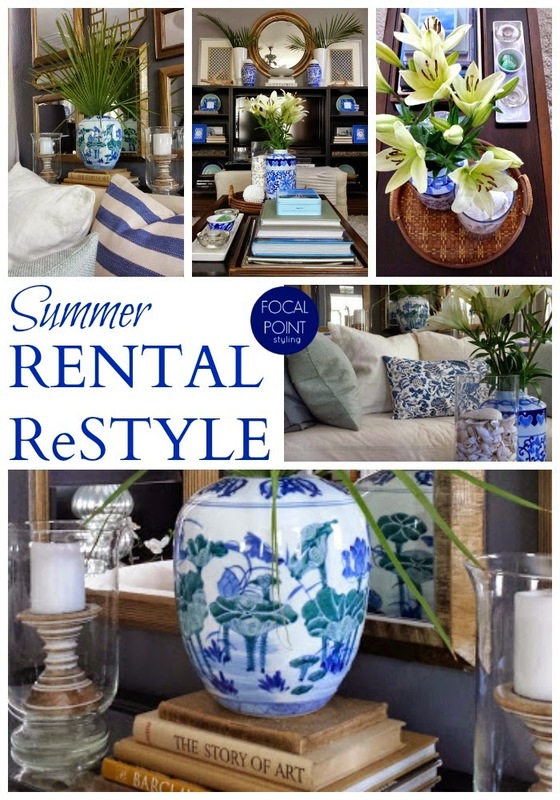 8 Tips to Create A Summer ReStyle. 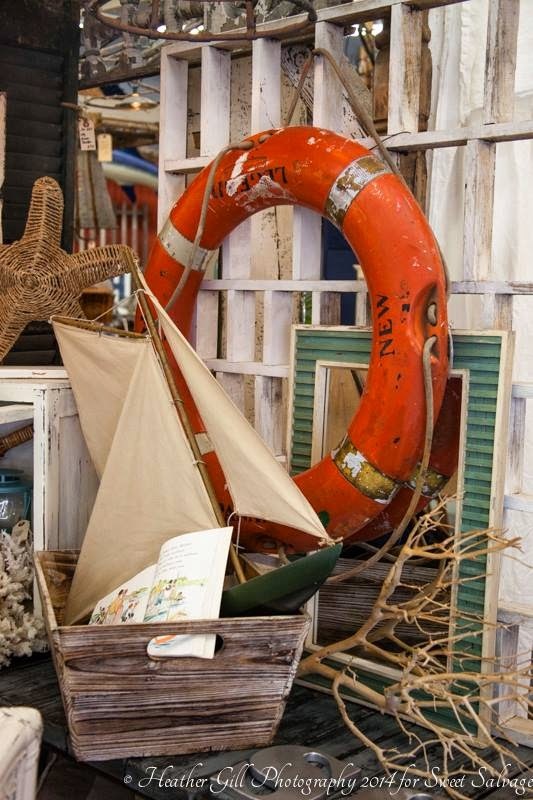 Do you decorate any different for Summer? 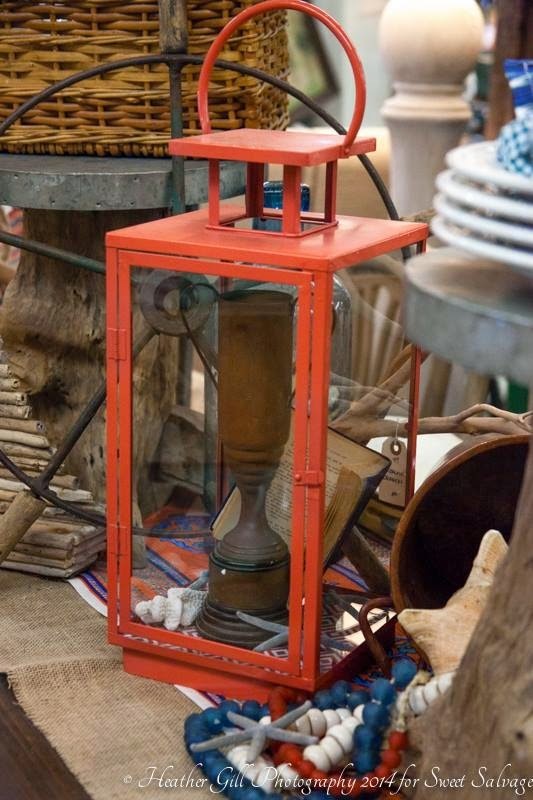 What are some ways you like to display your Summer style? 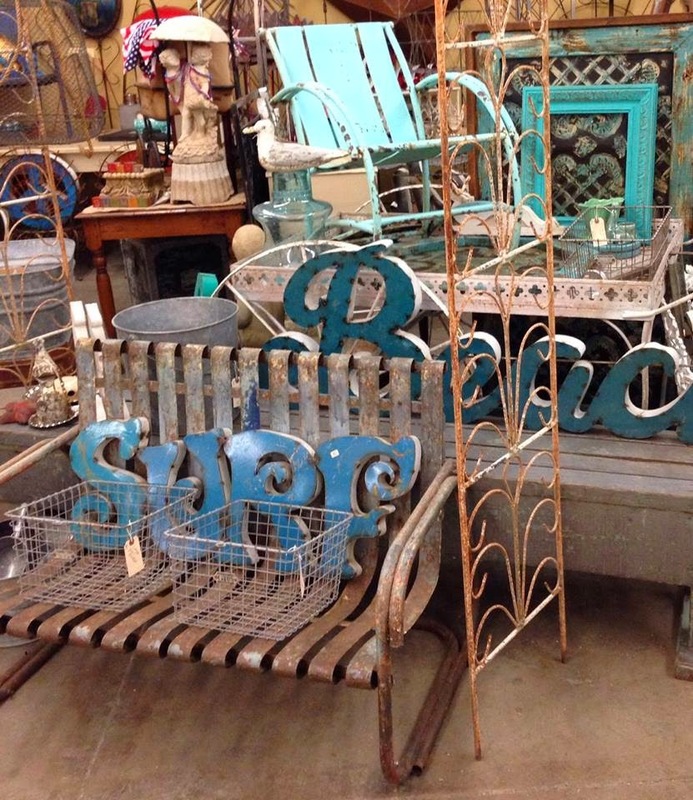 LOCAL LOVE: SNEAK PEEK of SUMMER LUVIN' at SWEET SALVAGE! 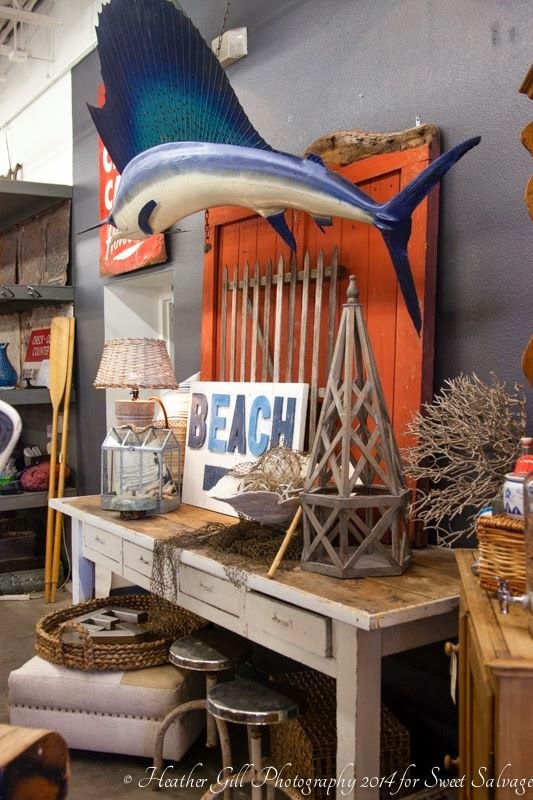 It's such a welcome sight to see for these sore eyes longing for the beach at Summertime... And what a wonderful way to kick off the Summer Solstice this Saturday by visiting the Sweet gang here in Phoenix! 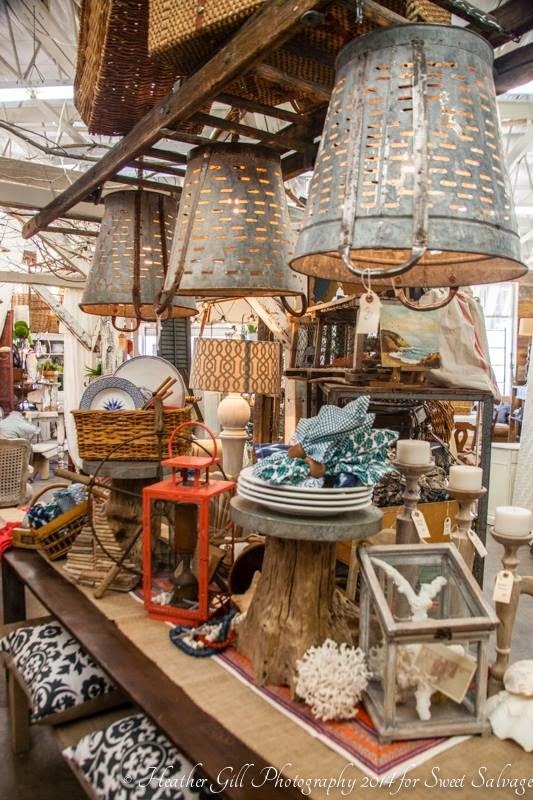 Summer Luvin' is also a great time to not only get decor inspiration, but also pick up coastal treasures, plus some Americana details to layer into your home for July 4th! 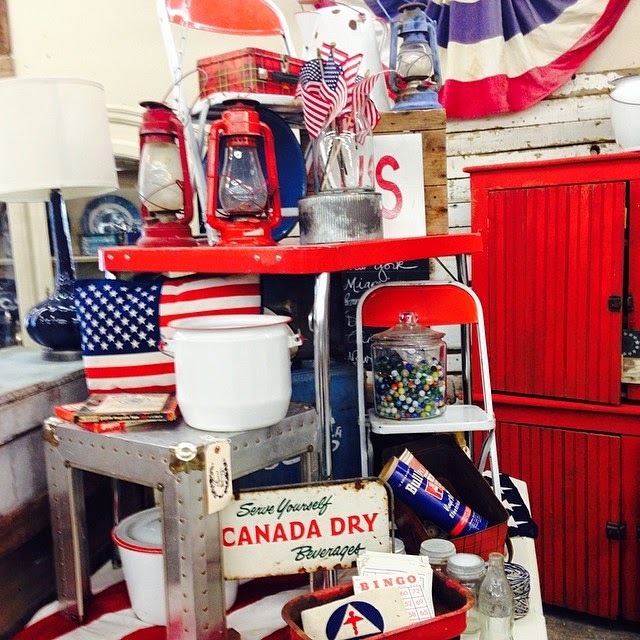 Hope you can make it - The pop-up shop event lasts from Thursday thru Sunday - June 19 - 22. 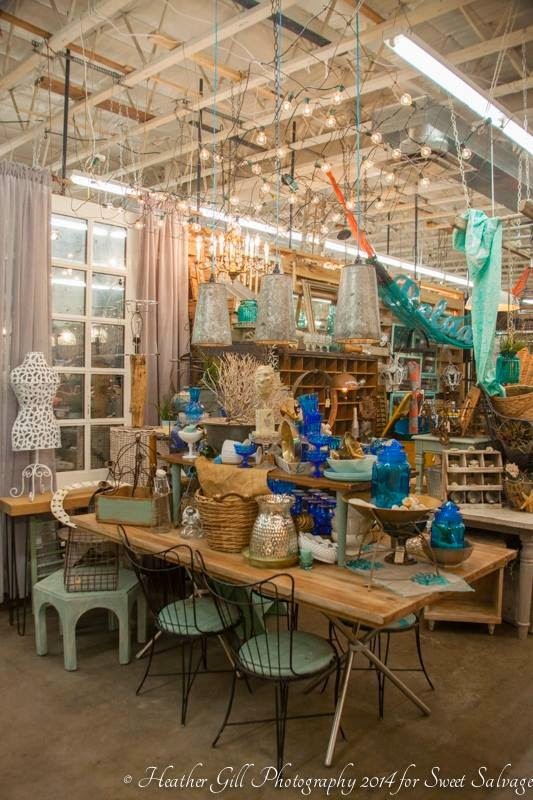 After seeing all of these great coastal finds, it kind of makes me wish there was a shop here in Phoenix that specialized in coastal decor year 'round!! Love the look! 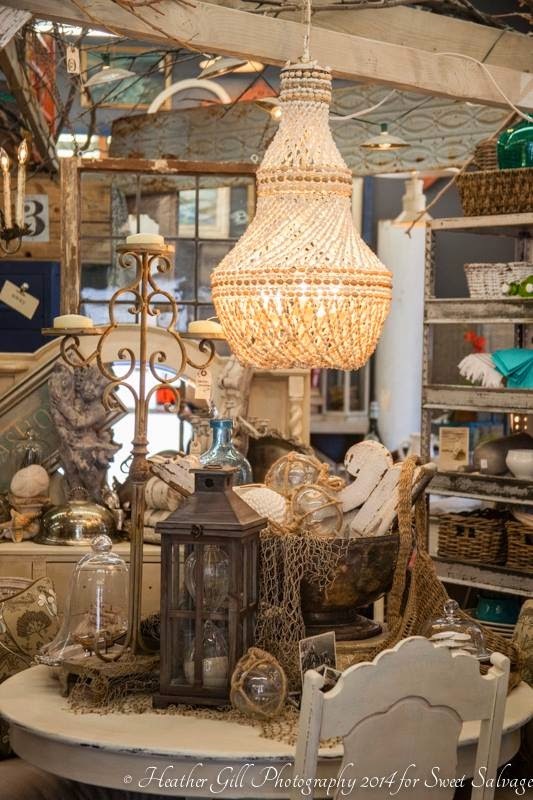 Thanks for stopping by and if you're in town, I hope to see you at Sweet Salvage! CELEBRATING OLIOBOARD - ITS MANY USES + TIPS!